As a group of musicians dedicated to the music of our time, Zeitgeist knows the most meaningful expressions of today are informed by the musical contributions of yesterday. The annual Early Music Festival honors that artistic debt with performances of influential and rarely-heard works by 20th century masters. April 6 & 7, 7:30 p.m. Guest Artists: Robert Adney and Alex Burgess, percussion; Marc Levine, violin; Julie Johnson, flute; Joshua Weinberg, harp; Scott Lykins, cello; Aliro Voices; Sumunar Indonesian Gamelan, Josh Misner, violin; Mary Alice Hutton, violin; Ellie Fregni, viola; Rachelle La Nae, cello; Nick Gaudette, bass; Matt McCright, keyboard. 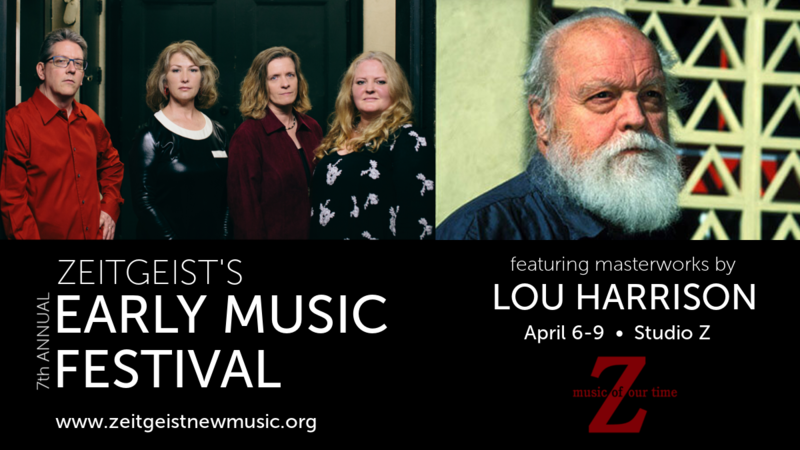 Over seventy years ago Lou Harrison (1917 - 2003) composer, environmentalist and gay icon, quietly began his own musical revolution. With superb craftsmanship he combined a reverence for world cultures, a passionate belief in social equity and a love of melody and beauty in all its forms, to create his own world of music. In his over 300 compositions for Western, Eastern, and custom-made instruments, Lou Harrison wrote for symphony orchestra, ballet, small chamber ensembles and soloists. He was a musical innovator and a visionary in the truest sense -- tirelessly knocking on the door of possibility. Michael Tilson Thomas acknowledged Harrison's mastery by commissioning him to compose "Parade for M.T.T." the first piece of music Tilson Thomas conducted as Music Director of the San Francisco Symphony. Performers such as Keith Jarrett, Yo-Yo Ma, The Mark Morris Dance Group and Dennis Russell Davies also premiered Harrison's music. Beyond his myriad musical accomplishments, Harrison's outspoken, lifelong involvement in political activism (ranging from pre-Stonewall gay rights and early civil rights, to pacifism and countless environmental causes) garnered him icon status in many communities. He was recognized with countless awards including membership in the American Academy of Arts and Letters, "Humanitarian of the Year" by the American Humanist Association, the Michael Callen Medal of Achievement from the Annual Gay/Lesbian American Music Awards (GLAMA), and Musical America's composer of the year 2002. ​Tickets can be securely purchased by credit card or through your PayPal account in advance, or by cash, check, or credit card at the door. Tickets purchased online will be held at the door. This activity is made possible with support from the Minnesota State Arts Board through an appropriation by the Minnesota State Legislature from the Minnesota Arts and Cultural Heritage Fund with money from the vote of the people of Minnesota on November 4, 2008.